Interested in a career related to sports, lifestyle and wellbeing but not sure where to begin? Sports and Lifestyle Psychiatry is an emerging specialty that could be a potential option for you! To understand what it’s like to be in this career and to know more information before you embark in this field, we briefly catch up with Dr. Amit Mistry, a Sports and Lifestyle Psychiatrist. He works in a Specialist Eating Disorders service and supports patients with mental illness and disordered eating behaviours. He holds an honorary clinical lectureship post with Queen Mary University London (QMUL) on Sports & Exercise Medicine (SEM) and is on the Executive committee of the Royal College of Psychiatrists (RCPsych) Sport & Exercise Special Interest Group (SEPSIG). chose to pursue qualifications in this area? Having been involved in competitive sport from a young age, I always wanted to create a career pathway that would combine my professional and personal interests in mental health and sport. 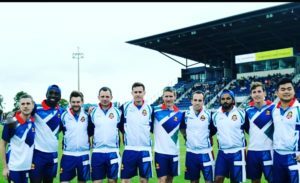 In 2015, I was given the privilege to take some time out of psychiatry training so that I could compete for Team GB at the International Rugby Tag Federation (ITF) World Cup. On returning back to the UK, I decided to spend my special interest day with Public Health England’s Physical Activity Clinical Champion Scheme to help promote physical activity for those with severe mental illness, something I have always been passionate about. Coincidentally, in 2016 the Royal College of Psychiatrists (RCPsych) set up the Sport & Exercise Psychiatry Special Interest Group (RCPsych SEPSIG). This network has been revelatory for my career development and allowed me to network with allied sports professionals and publish on topics such as wellbeing, exercise and elite sport mental health. Since working in eating disorders, I have come across a lot of athletes who experience disordered eating behaviours particularly around stressful transition periods e.g. after injury or team de-selection. My involvement with the SEPSIG has enhanced my understanding of eating disorders in the sporting context, which in turn has improved my therapeutic relationship with some of the patients I see in outpatient clinic. Through this clinical interest I have acquired an honorary clinical lectureship post on the Sport & Exercise Medicine (SEM) course with Queen Mary’s University London (QMUL). 2. What is the typical day in the life of a Sports and Lifestyle Psychiatrist? Sports Psychiatry is such a new discipline that there are not that many established roles for psychiatrists in the elite sport setting. However, in the view of recent high profile media reports of athletes experiencing severe mental illness (including tragic cases such as suicide), professional sporting bodies are increasingly recognising the preventative role psychiatrists can play in elite sport. A good example of this would be the recent appointments of two Sports Psychiatrists onto the English Institute of Sport (EIS), High Performance Mental Health Expert Panel. The most famous UK based, sports psychiatrist would be Steve Peters, author of the ‘Chimp Paradox’. His main role consists of working with elite sporting bodies, teams or working with athletes on an individual basis. Also, some psychiatrists with expertise in sport tend to work privately in this niche area. 3. What is the relationship between organised recreational activity and mental health? Over the last five years, the important message is finally getting out that recreational physical activity is not only beneficial for mental wellbeing but for mental illness too. There has been an increasing amount of robust data signaling the powerful effect of aerobic and resistance training for major depressive disorder. Also, it has been demonstrated that exercise possesses both positive physical and mental health benefits for patients with schizophrenia e.g. reducing metabolic syndrome risk and improving cognition. We know that these effect sizes are enhanced when led by an exercise expert and when performed in groups, particularly in elderly adults. However, the effect size reduces when participants have physical health co-morbidity too. 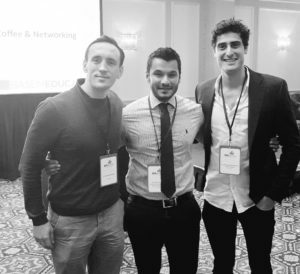 I was fortunate enough to meet, two leading researchers within this area, Dr Brendon Stubbs & Simon Rosenbaum at last month’s British Association of Sport & Exercise Medicine (BASEM) Spring Conference (see pic with Dr Brendon Stubbs & Simon Rosenbaum). 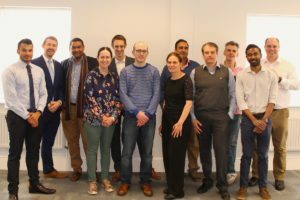 In terms of translating the research into everyday practice, Mind charity has recently set up a great physical activity initiative called, ‘Get Set to Go’. This free resource supports patients to engage in different forms of physical activity, led by peer supporters with lived mental health illness. I am proud to be supporting this scheme by part of its Mental Health and Physical Activity Advisory Panel. 4. Describe one thing you find fulfilling about working in the industry. My active interest in sports and exercise psychiatry has certainly enhanced my NHS training experience and expertise working with patients suffering from disordered eating behaviours. Being part of a national network of like-minded professionals has allowed me to pursue my clinical interests. For example, I have recently been accepted as lead author for an exciting project with Cambridge University Press called, “Cases Studies in Sports Psychiatry”. I am aiming for this to be the first ever author collaboration between sports professionals and athletes on addressing mental health issues in the elite sport setting. This should be published around mid-2020, just before the Tokyo 2020 Olympics. 5. What advice would you give to doctors who have interests in this career and what do they have to understand before embarking in your field? Fundamentally, interested parties need to possess a solid understanding of psychiatric skills before they should consider the elite sport setting. Also, one needs to ensure they meet curriculum essential skills as outlined by The International Society for Sports Psychiatry (ISSP) and other recognised bodies. Also, I would recommend getting involved with some related research project as this will help you understand some of the unique, mental health issues within sport and help you determine whether this is a potential career option for you. Furthermore, you would be contributing to an evidence base that is much needed in this growing area! Like any career, it’s imperative that one establishes a network and seeks out a mentor who is willing to support you with your ideas. I have been very fortunate in having several informal mentors through the SEPSIG network. SEPSIG is a very supportive group and would welcome any medics who wish to get involved and attend any of our events. The webpage can be found here. To get in touch with Dr. Amit Mistry, he can be contacted here or on Twitter: @DrAMistryPsych if you have any further questions!